Weddingcoupons.com Welcome to The official "Bride To Be Channel" wedding planning website. Find Local Fashions for Brides, Reception Locations and more! Bride To Be Wedding planning is a great place to find information regarding local Marriage Laws ,photographers, wedding vendors, wedding dresses, invitations, reception locations, bridal fashion designers, wedding gowns, honeymoons, jewelry, wedding bands, engagement rings, gifts and favors, disc jockeys, bands, limousines, budget saving ideas, hotels, tuxedos, insurance, real estate, bachelor & bachelorette parties ideas and so much more ! You will also receive detailed information from businesses in your area and special discount opportunities. 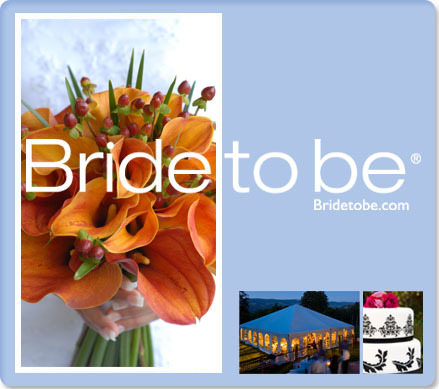 The Bride To Be Channel - bridetobe.com offers useful information and excellent resources from leading wedding businesses in your area that may be of interest to you.